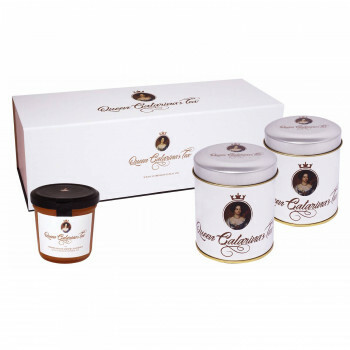 Queen Catarina's Tea is a delicate and refined tea. Made with Pu-erh Green Tea over 10 years old, extracts of cinnamon and sweet orange from Portugal. This set is composed of a tea can of Queen D. Catarina de Bragança, with 20 sachets packed in a hermetical bag, a jar of Orange marmalade of 125 gr, Bag and tape for wrapping. A special blend of tea in honour of Queen Catherine of Braganza, who introduced her love of tea to the British. It brings together the unique flavour of Pu-erh Tea (known as the Emperor's Tea), the taste of Portuguese oranges and the cinnamon aroma as a reference to the Portuguese discoveries. To enjoy this unique tea, our team has produced a distinctive, elegant package. Inside you will find two cans of tea - each with 20 sachets inside a protective bag to maintain the aroma - and one marmalade jam (125g). Additional information: geral@folhadagua.pt and 00351 253 540 103 (working hours).